Learn to windsurf while making new friends! 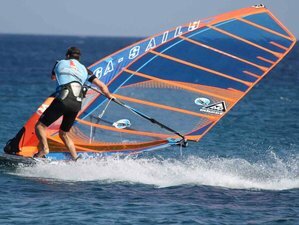 Do you want to learn windsurfing fast while having lots of fun? Do you like being part of a team? Then Spinout's windsurfing camp is made just for you! Jump on a windsurf board and share the experience of your new skills day by day. You can also opt to explore the area by paddle board. After riding on the turquoise water, have some unforgettable adventures while discovering Kos Island. As a participant of the Spin Out windsurfing camp, you can stay at the Spin Out club free of charge. Your sleeping area will be located just 40 meters away from the water, under the wooden roof of the club that will protect you from the sun, wind, or rain. Please don’t imagine anything fancy and bring along your sleeping bag and share your freedom experience. Hot shower and Wi-Fi are included. You will have windsurfing lessons with one of Spin Out's enthusiastic instructors. In a few days, they will teach you how to windsurf! After or before your lessons, you can practice your new skills with the brand new equipment. You will get unlimited usage of standup paddleboards. This will help you to master the water-balance without even realizing it. You are not only having great fun but in fact, you are practicing. Note: This program includes three windsurfing lessons (60 minutes each). Please contact Spin Out if you wish to have further instruction time. Petros is a windsurfing instructor and wave lover who has been windsurfing since 2006. Anastasia is a passionate windsurfer and a windsurfing start instructor (non-tidal). She has level 2 power boating license and UKCC level 1 certificate in coaching paddlesports (kayaking and canoeing). You will do the windsurfing on the beautiful Kardamaina Beach on Kos Island, Greece. Kardamaina is a perfect location for windsurfing because of its flat waters and steady wind and you can have a long party every night. You will never get bored - unless you want to be. You will love a night visit to the mineral springs where you can enjoy the hot water right on the beach, under the stars and far away from the crowds. Expect also some barbecue parties on the beach, bike trips, and lots of fun while visiting together the best bars in the nearby Kardamaina town - that is well known amongst partygoers for its rock-solid nightlife. In case of a windless day, you can always hop on the next island to check the moon-like landscape of the active volcano of Nysiros. Please book your flight to arrive at Kos Island International Airport (KGS). Transfer from the airport is included. Spin Out will pick you up from the airport. Airport: Kos Island International Airport Airport transfer included: Kos Island International Airport No additional charges. You can request this in the next step. Spin Out is a windsurfing and SUP center located on the beach of Kardamaina, Kos island, Greece. It offers rentals and learning courses for all ages.